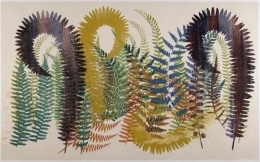 James Cohan Gallery Shanghai is pleased to present the exhibition Alchemy & Inquiry with works by three prominent American artists, Philip Taaffe, Fred Tomaselli and Terry Winters. 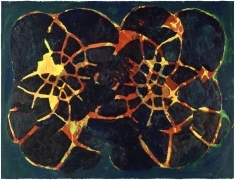 The exhibition was organized by independent curator Raymond Foye and Senior Curator Jennifer McGregor at the Wave Hill botanical garden and cultural center in New York City, where this exhibition first originated and was on view from April to June, 2011. Nature and the natural world have long inspired artists in both Western and Eastern cultures. 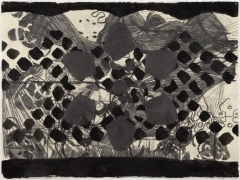 While each of the three artists in this exhibition have their own distinctive and innovative approach to their process and materials, they each share a common interest in producing works that become diverse, visually engaged responses to the ways in which they study nature and observe the changing landscape. 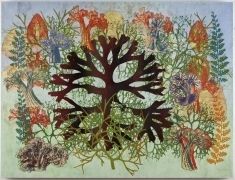 For Philip Taaffe plant life and botanicals have been a significant and continued source of inspiration for the artist’s work. 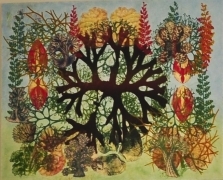 Through intensive research drawn from the artist’s extensive library of rare books Taaffe takes an accumulative approach to his works, often combining nature-printing techniques, collage, and painting. 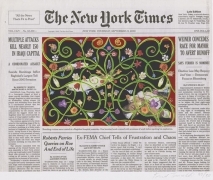 In the works by Fred Tomaselli there is an encyclopedic interest in popular culture, art history, and the artist’s own engagement with the natural world around him. On view will be paintings and photograms using actual plant material collected from the artist’s own garden in Brooklyn, New York. 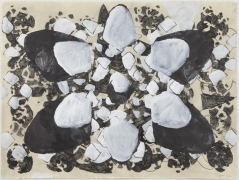 Throughout his career Terry Winters has explored a wide range of subjects from biological processes, scientific and mathematical fields, the structural underpinnings of nature, technology and the human mind as source material for his paintings, drawings and prints. This exhibition also hallmarks a return to botanical imagery. All three of these artists have participated widely in international exhibitions. 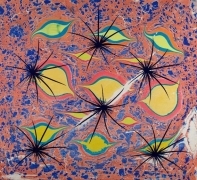 Philip Taaffe’s work has been included in the Carnegie International (1999), the Biennale of Sydney (1996) and the Whitney Biennial of American Art (1991, 1995), with individual survey exhibition at IVAM, Valencia, Spain (2000), Galleria d’Arte Moderna, San Marino (2004) and Kunstmuseum Wolfsburg, Germany (2008). 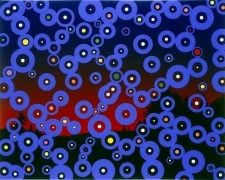 His works are in numerous public collections including the Museum of Modern Art, New York; the Philadelphia Museum of Art; The Whitney Museum of American Art; the Solomon R. Guggenheim Museum, New York; the San Francisco Museum of Art, and Museo Nacional Reina Sofia in Madrid, Spain. 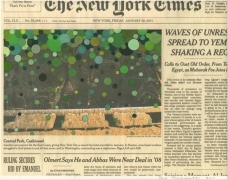 Fred Tomaselli’s recent mid-career survey opened at the Aspen Art Museum, Aspen, Colorado in 2009 and traveled to the Tang Museum, Skidmore College, Saratoga, New York and to the Brooklyn Museum, Brooklyn, New York where it was on view last fall. 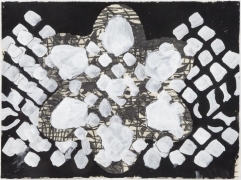 His works have been included in solo exhibitions at White Cube, London and James Cohan Gallery, New York. 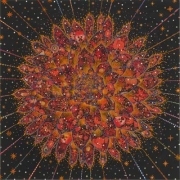 Fred Tomaselli: Monsters of Paradise originated at The Fruitmarket Gallery, Edinburgh, Scotland (2004), traveling to Domus Artium, Salamanca, Spain; Irish Museum of Modern Art, Dublin, Ireland; The Rose Art Museum of Brandeis University, Waltham, MA (2005). 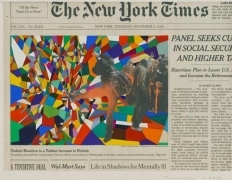 His work has been included in numerous group exhibitions such as the 17th Biennale of Sydney (2010); 2004 Biennial Exhibition, Whitney Museum of American Art, New York. 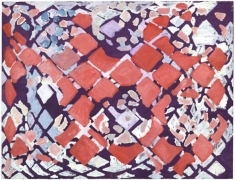 Tomaselli’s work is included in numerous distinguished museum collections including the Carnegie Museum of Art, Pittsburgh, PA; Hirshhorn Museum and Sculpture Garden, Smithsonian Institution, Washington, D.C.; Museum of Modern Art, New York; San Francisco Museum of Modern Art; The Chicago Art Institute, Chicago, IL; and the Albright-Knox Gallery of Art, Buffalo, New York. 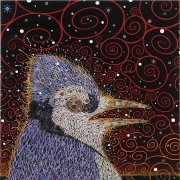 Terry Winters has exhibited extensively and his works are included in important collections throughout the United State and Europe. He has had solo exhibitions Whitechapel Gallery, London (1999); The Metropolitan Museum of Art, New York (2001); Irish Museum of Modern Art, Dublin (2009). Terry Winters Paintings, Drawings, Prints 1994-2004, The Addison Gallery of American Art, Andover, MA, traveled to the Museum of Fine Arts, Houston, Houston, TX; Museum of Contemporary Art, San Diego, CA (2004). An illustrated bilingual (English/Chinese) brochure accompanies this exhibition with a text by the noted American writer, poet and essayist Peter Lamborn Wilson.